DOMS is a muscle pain or discomfort that occurs as a result of muscle damage after a strenuous exercise. It usually appears one or two days after the damage is done and can last for several days. Most believe soreness develops as a result of microscopic damage to muscle fibers involved the exercise. How severe can muscle soreness (DOMS) be? The severity depends upon how much the muscle is damaged causing swelling, leading to the pain, stiffness and weakness. Heel pain is a common foot condition related to this. FACT: This is a common misconception about DOMS, lactic acid is not a component of this process. DOMS appears to be a side effect of the repair process that develops in response to microscopic muscle damage. DOMS Myth 2: DOMS is same as the soreness one feels during a strenuous activity. 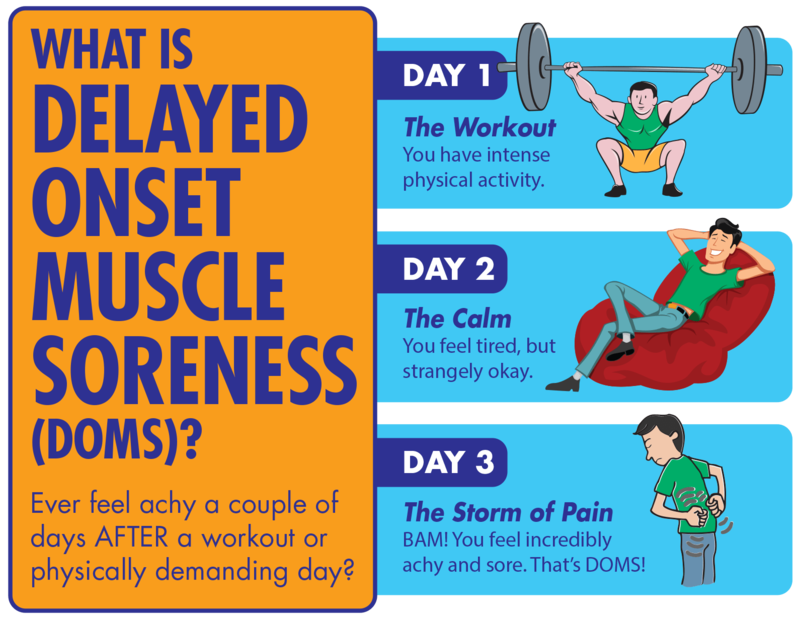 FACT: The delayed onset muscle soreness is different from the soreness or pain felt during the action or activity. DOMS is felt most intensely around 24 – 72 hours after exercise, and can produce the greatest pain. FACT: To your surprise, some people love and enjoy DOMS (very small percentage of people) because to them the pain associated with DOMS represents an effective workout. FACT: Do not mix up DOMS with an all prevailing general body pain that lingers on even if you haven’t undertaken any strenuous activity or exercise in the last 2-3 days. Stabbing unbearable pain and dullness in body in absence of physical strain could be symptomatic of Neuralgia. Read more about Neuralgia here. 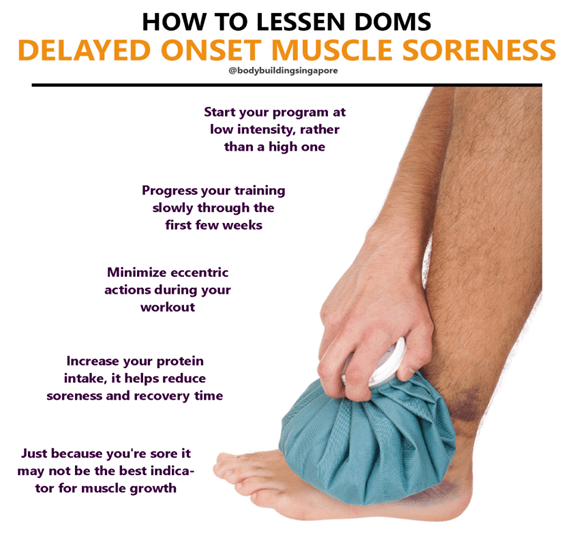 How to lessen Muscle soreness (DOMS)? Often, symptoms diminish during activity, but they will return after recovery. Performing exercise while experiencing severe symptoms may make matters worse. On the other hand, light activity should not impair your recovery. However, there is also not much evidence that this will hasten your recovery. If you find that your symptoms make it difficult or too painful to perform the activity, then it is advisable to refrain from the activity for a few days and return to the activity as symptoms subside. How can I prevent muscle soreness after exercise? If a person is training for the first time, or starting a new exercise program which the body is not used to. Everyone must have experienced DOMS at some point, though the people who are used to training, or have been training for longer (including bodybuilders), are probably less susceptible to it, but still experience DOMS sometimes when there is a change as mentioned above. Does DOMS only cause soreness? DOMS symptoms do not typically necessitate the need for medical intervention. If the pain level becomes debilitating, if limbs experience heavy swelling or if urine becomes dark, then medical consultation is advisable. Presently, the best treatment for DOMS appears to be muscular activity, although the sensation again returns following the exercise. Training for the specific contractile activity that causes DOMS reduces the soreness response, says a study in Medical Science Sports Exercises. the lengthening of the thigh muscles while the limb brakes against your body’s momentum as it walks or jogs down a hill. Jogging or running on a flat surface can also elicit DOMS symptoms for those who are unaccustomed to this type of activity. The severity of soreness depends on the types of forces placed on the muscle. Running down a hill will place greater force on the muscle than walking down the same hill. The soreness that develops will likely be greater after running down a hill. A high number of repetitions will cause more damage and soreness than a low number of repetitions. As a result, work your way gradually into a new exercise program. All people are susceptible to DOMS, even those who have been exercising for years. However, the severity of soreness normally becomes less as your body becomes adapted to work it regularly performs. Just one bout of soreness producing exercise actually develops a partial protective effect that reduces the chance of developing soreness in that same activity for weeks or months into the future. If you found this article helpful, hit the share button at the top. If you wish to stay tuned to similar articles on the latest in the area of movement and recovery, then click the subscribe button below. This article is contributed by Dr. Swapnaja Joshi (PT). Dr Swapnaja is a Masters in Musculoskeletal Physiotherapy. She is very popular among her patients for her positive demeanor and effective treatment. She can be found at one of the ReLiva clinics.